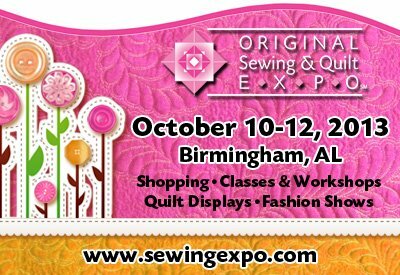 The Sewing Room is your exclusive BabyLock dealer for the Original Sewing and Quilt Expo 2013 in Birmingham, AL! We are local to Birmingham with our store located only 3 miles from the Cahaba Grand in the Inverness Corners shopping center at Hwy 280 & Valleydale Rd! Special pricing for the BabyLock Evolution sergers used in the classroom during the Expo!!! Special Event Pricing on our BabyLock machines!!! Come see the latest in serger innovation... the BabyLock Ovation!!! Visit with us at booth #702! 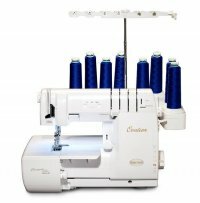 The Sewing Room will be doing special free demos/presentations on the Event Stage and at The Spot on our incredible sergers and the Sashiko quilting machine daily throughout the event! Come learn how to make 15 minute ruffle pants with the BabyLock sergers! Come see how sensational the Sashiko quilting machine really is! We can't wait to see you there!! !